I asked my very favorite frequent flier and F&W Contributing Editor, Andrew Zimmern, who travels the world for his show Bizarre Foods on the Travel Channel, for his favorite dining spots in airports. He obliged by giving me his favorite places to eat in 12 airports around the country. From now on, I’m booking all my flights with stopovers in Minneapolis. Now, take it away, AZ! The cooked food in airports in America used to be downright offensive; food overseas was worlds better. But now there’s enough fun places to eat here in the US that I have to keep a list going for where to chow down when I am on the go. Croque Madame, JFK, Terminal 2, NYC. Andrew Carmellini makes some great sandwiches and salads, including the chicken salad sandwich, but I always seem to order the same thing: the superb, cheesy, salty croque-madame, made with real Gruyère cheese. One Flew South, Hartsfield-Jackson International Airport, Terminal E, Atlanta. This is a great place to grab a real meal. Self-described as Southern soul, the place also has a sushi bar, and while most restaurants that try to be all things to all people end up being nothing to anyone, this place is the odd man out. If the lamb ragout is on the menu, grab some. Real food for travelers. Custom Burger by Pat LaFrieda, LaGuardia, Terminal D, NYC. This place makes a thick, creamy coffee milk shake to pair with my griddled plain burger that hits the spot whenever I am flying through NYC. Think Shake Shack-style and you’ve got it. Legal Sea Foods, Logan Airport, Terminals A, B & C, Boston. If my Boston layover is longer than two hours, I like to leave the airport and dine on the far side of the Callahan Tunnel (three-minute cab ride) at Santarpio’s for some pizza, grilled lamb and sausage. But if I don’t have time to leave, I love Legal. Good raw bar; nice soups; tasty, fresh calamari; and on several occasions, a nice lobster roll at the Test Kitchen in Terminal A. Terminal C has the traditional restaurant. Skewers By Morimoto, LAX, Terminal 5. Morimoto’s new fast, casual concept is superb. 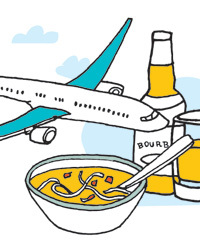 It’s everything you want from an airport experience—fast and easy with tasty grub. They have really tasty kushiyaki (grilled robata-style meat/poultry/seafood over rice) and kushiage (panko-crusted or tempura-fried). Both are popular snack-y street/bar food in Japan. Now you can see why. Matsutake Sushi, Ronald Reagan Washington National Airport, Delta Terminal, DC area. I like to stop at this Japanese restaurant for lunch. The food is very good; it’s a far cry from the prefab airport sushi everyone else serves. There is also a Five Guys burger shop that makes handmade burgers and fresh-cut fries to order, love that place. Shapiro’s Deli, Indianapolis International Airport, Concourse B. If you are ever in this city, Shapiro’s makes a really good Reuben. Tortas Frontera, O’Hare International, Terminals 1 & 3, Chicago. There’s an amazing set of sandwiches at Rick Bayless’s Tortas Frontera. Despite the sometimes-lengthy waits for my torta to get made and boxed, I go out of my way to stop here every time I am in that airport. Salt Lick, Austin-Bergstrom International Airport, West Terminal. At the airport there is a small outpost of the famous Salt Lick restaurant and the brisket is hand-cut to order and pretty darn tasty. Jim Neely’s Interstate BBQ, Memphis International Airport, Terminal B. The ribs at Jim Neely’s are as good as I have had in an airport. BBQ snobs may quibble, but they really hit the spot if you are a hungry, weary road warrior who is bored with the usual food court crap. Acme Bread, Cowgirl Creamery and Tyler Florence Rotisserie Chicken, SFO, Terminal 2. Speaking of food courts: Acme, Cowgirl Creamery and Tyler Florence’s chicken joint are all basically side-by-side here at SFO. Terrific on their own and if you combine all three you can have an amazing meal. T-Flo also does porchetta there that my travel-mates said was killer. Taste of Shoyu, Surdyk’s Flights, MinniBar, Minneapolis-St. Paul International Airport. I saved the best for last. In my hometown we have some of the best airport grub in the country. Shoyu, a ramen and rice shop that I adore, makes bowls of pork ramen and platters of crab fried rice with XO sauce and a fried egg on top. Surdyk’s will send you off on your travels with terrines, cheeses, jamón Iberico and anything else you need for the flight. I always go for a prosciutto-and-mozz on pretzel bread that makes in-flight dining a pleasure. There is also MinniBar from Andrew Zimmern, which makes the best airport sandwiches in America. But I am biased. Follow Kate Krader on Twitter @kkrader. Best Sandwiches in the U.S.